I have recently moved to Spartanburg, South Carolina, where my wife Eliza has started at job teaching at Wofford College. One of the remarkable things about my new town is the trash collection: everyone uses the same trash can, and then a truck with a robotic arm comes by, picks up the can, and dumps the contents into the truck. No trash collectors involved, other than the person driving the truck. 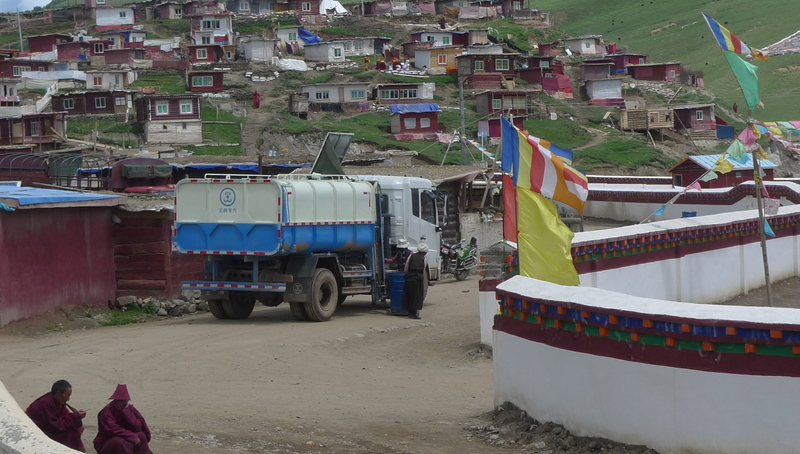 Other people may be more familiar with this type of trash collection, but I have only seen it in one other place: the late Khenpo A-khyuk‘s encampment at Yachen Gar, in remote Kham (see fig. 1). 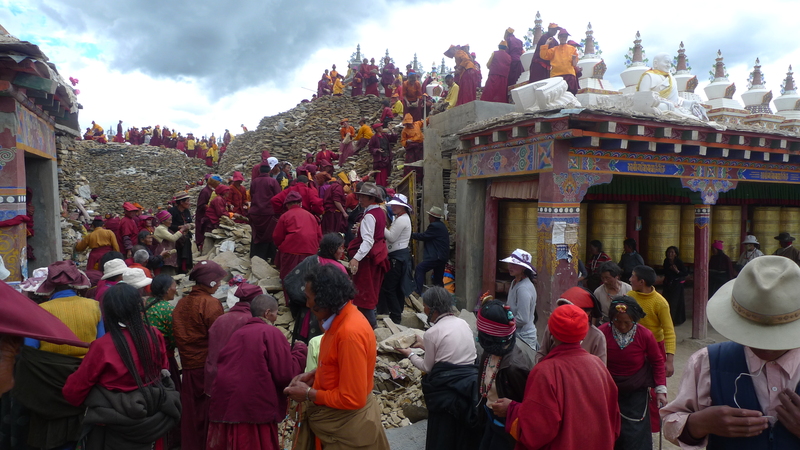 As those who have been to Tibet recently can attest, trash is a major issue. When Eliza and I visited Dzogchen Monastery in 2007, trash cans were overflowing, the hillsides were covered with refuse, and there was a huge pile of assorted garbage just outside the town. I get the impression that Tibetan culture simply has not yet figured out how to deal with all of the potato chip wrappers, beer bottles and cheap clothes that have accompanied it’s rapid introduction to modernity over the last few decades. 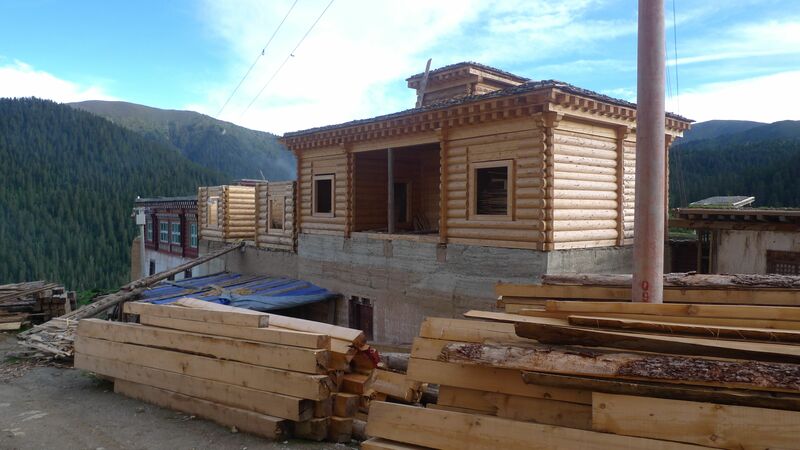 Yachen Gar is a new religious center, about six hours away from Kardzé on in one direction and Pelyül in the other. It has grown rapidly since its founding in 1980, and when I visited in June of 2010 there were several thousand residents. 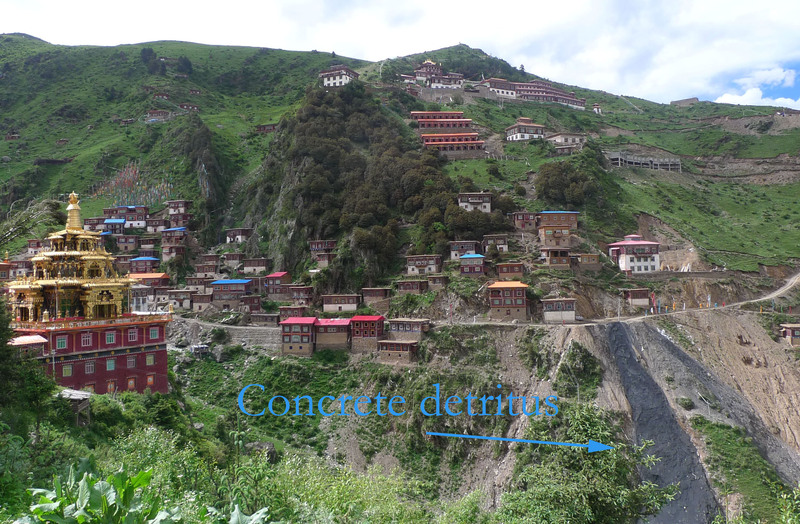 Each of these monks and nuns are responsible for their own housing and food, and the facility is composed almost entirely of homemade shacks (see fig. 2). Not the kind of place you would expect to find cutting edge trash collection. And yet there was this blue and white truck, making it’s way down the major streets, with two women putting the matching blue trash cans in position, and the truck doing the rest. Truly remarkable. 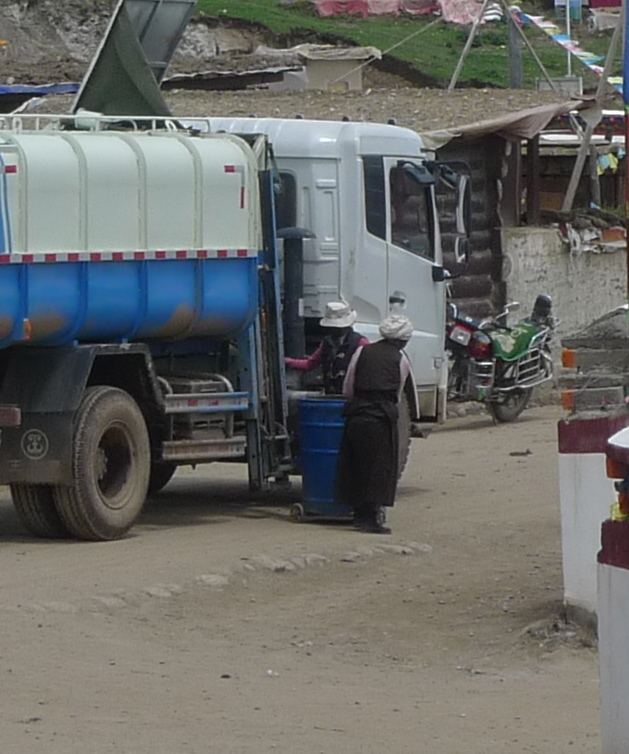 This is not to say that the trash situation at Yachen Gar has been taken care of entirely (I watched one nun throw an old plastic washbasin in the river), but these trucks were a remarkable sight, and a sign that things are moving in the right direction. Pitching in to build a colossal Mani Wall. Every one of those stones is inscribed, and the whole collection could easily cover a football field to a depth of several meters. 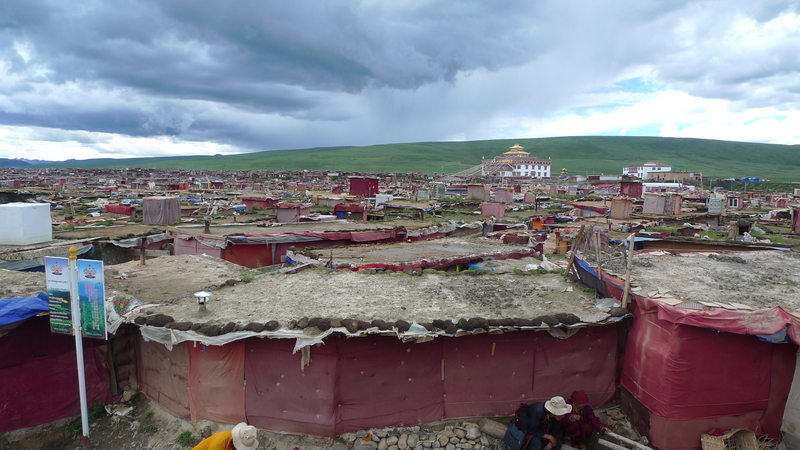 Yachen Gar is one of the most remarkable religious institutions in Tibet today. 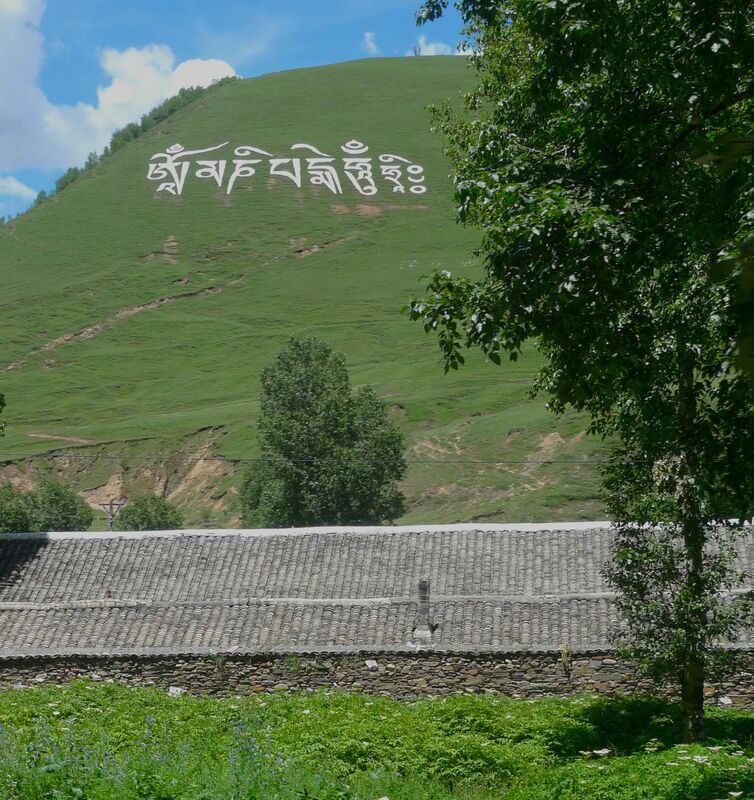 Like Khenpo Jikmé Püntsok‘s more famous institute at Serta, it was founded by a charismatic tertön in the period just after Deng Xiaoping allowed religious practice. 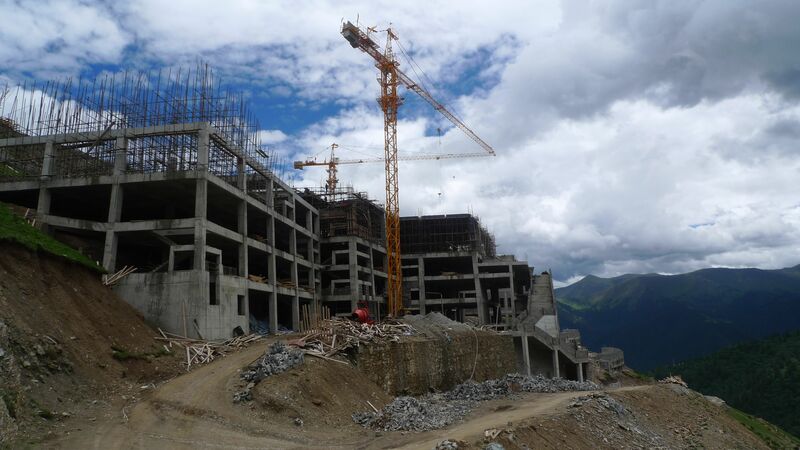 Since then it has grown to be one of the most active and vital teaching centers in the Tibetan world–both inside the PRC and among the exile communities. Sadly, the founder, Khenpo A-khyuk, passed away in July. This is a huge loss, not just for Yachen Gar, but for Tibetan Buddhism and the Nyingma tradition throughout Kham. It remains to be seen how this will affect Yachen Gar on a daily basis. I will be traveling through the region in the coming year, and will post whatever thoughts come to mind, though I will leave a thorough analysis of the coming transition to others. For more info on Khenpo A-khyuk and Yachen Gar, please read Antonio Terrone’s excellent article, “Householders and Monks: A Study of Treasure Revealers and their Role in Religious Revival in Contemporary Eastern Tibet.”, found in Buddhism Beyond the Monastery: Tantric Practices and their Performers in Tibet and the Himalayas, published in 2009 by Brill. You may have to use inter-library loan to get this, as Brill has priced it at a whopping $136. I heard a story recently that I thought was worth passing on. I have no idea if it is true, but I like it anyway. In 1903, President Teddy Roosevelt went on a train trip across the country, visiting notable scenic spots. 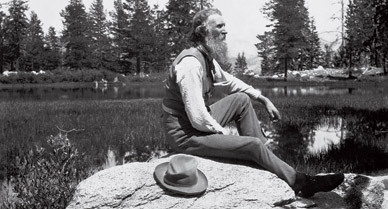 In California, he visited Yosemite, where he met John Muir. Apparently they took a liking to each other. A dinner was planned in their honor at the Wawona lodge. Before the dinner, the two told Roosevelt’s staff that they were going for a walk in Mariposa grove. They didn’t tell the staff that they weren’t coming back that evening. And so the founder of the conservation movement and the founder of the National Park system managed to give the secret service and everyone else the slip, and spend three days together in the woods. No tents or other gear, just conversation and the biggest trees on earth. True or not, its a pretty good story.